These days, it’s not only women who sell Papillon skincare products; many men also generate an income from selling our formulations. Additionally, both ladies and gents realise that good skincare is essential and therefore use Papillon’s naturally formulated skin solutions. In every successful sales function, it’s extremely important that the salesperson has adequate knowledge about the products that they’re selling either committed to memory or readily available, thereby enabling them to answer customers’ questions and provide them with relevant information. When selling skincare products, it’s essential and professional to have product information on hand. The ability to answer customers’ questions is vital. It’s up to you to truthfully tell the customers about the products, what they’re intended to do and how to use each. You, the seller, are the buyer’s source of information. The skincare seller should also believe in the particular products that he or she is selling, regardless of what the product is, because the sales agent cannot expect a customer to have faith in a product that he/she, doubts or distrusts. The ideal relationship between a customer and the sales agent should be one of mutual respect and trust. Our Papillon range of skin products consists of five essential formulations for your daily skincare routine that are designed to transform your complexion, and make you and your skin look good and feel great. After all, when your skin is in tip-top condition, you look and feel healthy, radiant, vibrant, and ready to tackle the world. All our products are loaded with natural ingredients that are effective; we make extensive use of plant and herbal extracts in our formulations. Our skin range is mild and gentle on the delicate facial skin. No Papillon products are tested on animals. The five daily essentials include an anti-microbial, anti-inflammatory, soothing and toning face wash, a gentle, exfoliating scrub to remove dead skin cells and stimulate circulation, an invigorating, refreshing toner to remove any remaining impurities and soothe perfectly cleansed and prepared skin, and two moisturising, nourishing, and hydrating creams (a day cream and a night cream). Papillon’s skin treatment product – a skin brightening cream – helps to brighten the complexion, producing radiant, glowing, more evenly toned facial skin. The visible appearance of hyperpigmentation marks is reduced by incorporating alpine plant and 100% natural extracts of other plants that enhance the brightening action to reveal a lovely, luminous skin surface. Our effective, top-quality, mild, and gentle skin range is exceptionally affordable. For your Papillon customers’ convenience, our five essential skin products are available as individual, single, full-sized products, and/or a full set of five full-sized 150-ml routine skincare products. Our skin brightener sells individually – also very affordable. Our website’s section on our skin products contains detailed information on the entire range. It’s almost impossible to remember every ingredient and its benefits. 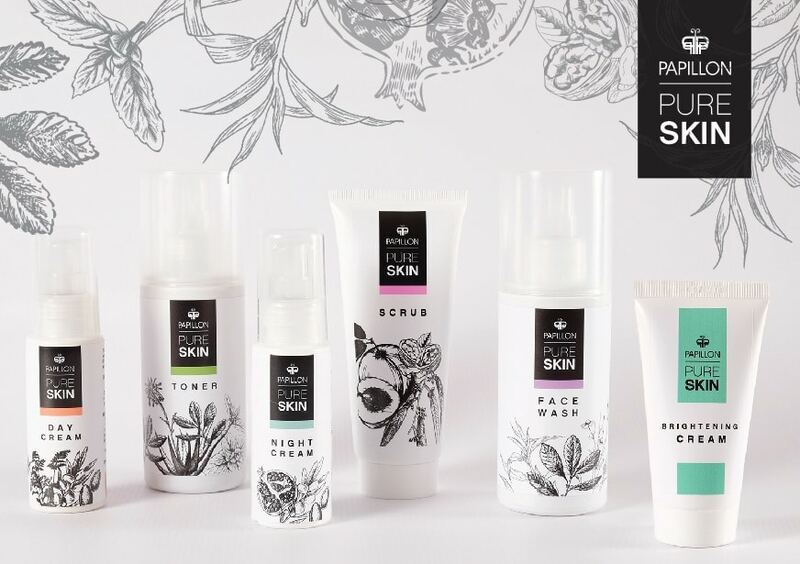 Make a copy of this page for your easy reference when selling Papillon skin products.